If you are familiar with a database program like Microsoft Office’s “Access” you may want use it for recording information about your bottles. A database gives you nearly unlimited freedom to design a database to meet your specific needs. Once set up, it is a practical and convenient way to record your information. You will know what questions you need to ask about your bottles every time. 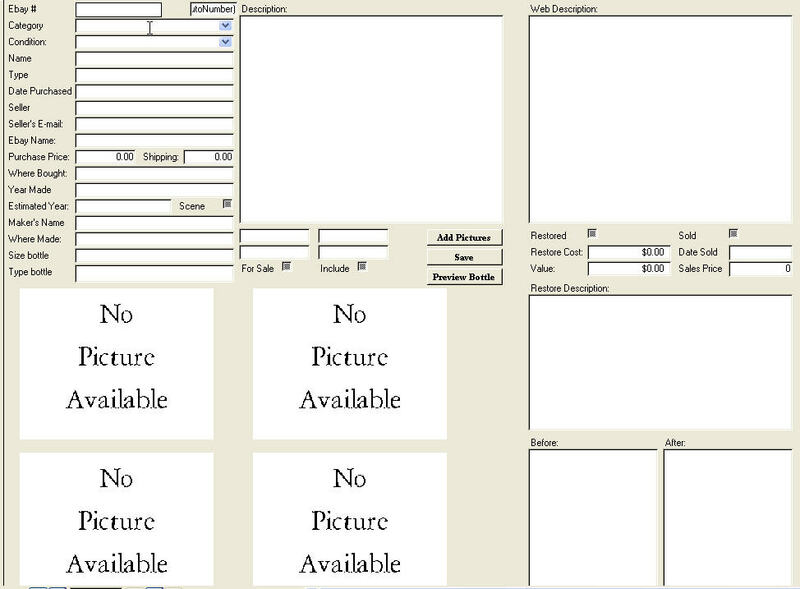 Attached you will find a copy of an Access database form that I use for my personal collection. In addition to the form you see below, I have several other forms, tables, queries, reports, and micros set up so that I can use of the data and information I have logged in any number of ways. For example, I can always get an accurate and up-to-date summary of my total investment including the purchase price, shipping costs, and restoration cost when it applies, or a breakdown by the type or category of bottle I own. Feel free to use any of these fields in your database if it suits your purpose. If you have and already use Microsoft Access that comes with Microsoft Office and are interested in buying a ready to use template for your collection with tables, forms, queries, and reports already created, contact us using the email button in the top menu for purchasing information.